birdsong, thunder, green, cicadas, and heat. ~ Margaret Holley, from "Walking Through the Horizon"
This morning I awoke to the fading aroma of rain, ozone and bluebells; remnants of another empyrean dream. With a lethargic breeze drifting through open windows and shower-fresh skin sliding against crisp cotton sheets, I have been falling, blissfully, into dreams that leave me feeling tranquil and wistfully nostalgic. I wish I could hold onto that serenity, or slip into its ambiance like a linen summer dress. Currently I'm basking in the retelling of my latest vanishing dream, and I am savoring the last slice of this equally ethereal cake. This cake is a violet among roses. It looks simple and unassuming but if you steal a second glance, you can see its vibrant intellect and humble sophistication. The recipe is similar to a chiffon cake; egg whites are whipped separately before being folded into the batter. This whipping/folding technique gives cake an airy, almost weightless, texture. I love baking with olive oil because it offers a light, floral undertone that balances out the snarling sweetness of sugar, and it's the perfect companion to darling lemons! This cake is absolutely perfect for late spring. It's floral and citrusy, and graceful enough to enjoy in the morning. Just a few recipe notes: if you can't find lavender-infused sugar, feel free to use regular granulated. Also, be sure your olive oil is extra virgin (anything else will give the cake a heavy, oily aftertaste). Preheat oven to 350 F. Grease/oil a 9-inch springform pan, line bottom with parchment paper and oil the parchment. In a large mixing bowl, combine lemon zest and granulated sugar. Use your fingertips to rub zest into sugar until moist and aromatic. Add egg yolks and beat on high speed until pale and thick (about 5 minutes). Add lemon juice, olive oil & almond extract; beat on medium speed till combined. Remove beaters and switch to a large wooden spoon. Add flour and salt; stir until just combined (try not to overmix); set bowl aside. In separate clean + dry mixing bowl fitted with whisk attachment (if using a stand mixer), add egg whites. Beat on med-high until foamy. Gradually add 1/4 cup of lavender sugar whilst beating. Continue to beat until soft peaks form (try not to overbeat). Fold in about 1/3 of the egg whites into yolk mixture to lighten. Add remaining whites and continue to gently fold into batter till just combined. Pour batter into prepared pan and gently rap against counter once or twice to release air pockets. Sprinkle with 1 Tablespoon of granulated sugar. Cool to room temperature. Garnish with sifted confectioners' sugar and almonds before serving. What a gorgeous cake and I bet the texture is just heavenly! I have never baked a sweet cake with olive oil (have done savory/cheesy muffins once with olive oil) I know I should try but I am always worried about it tasting too olive-ey but as you said, use extra virgin olive oil to avoid that. I'd love to try a slice of this beauty! This cake feels just like a warm summer morning with the kiss of a light breeze blowing in... love the lemon lavender and that inviting crackled top! Lovely cake and delicious writing. And I always love a shout-out to Loki. Love olive oil cakes, once I made an olive oil and orange cake and it was delicious. I bet this is wonderful with the lavender. Yes and yes! I LOVE me some good-for-the-soul poetry. Aaaaand good-for-me cake! This is beautiful. The flavors are making my heart sing! Hello! This looks lovely! Could one make lavender-infused sugar? I have both on hand but wasn't sure if it was a complex process! You have such a creative soul, Valerie, and this cake is just stunning, I love the light in your photos. Oh my gosh - this looks so great! I adore making an olive oil cake. I could literally eat half this cake in one sitting. Nice job! You have such a gorgeous blog, Valerie! Really, I feel like a fool for not stumbling upon it earlier. Your recipes sound luscious, your photography is stunning. Definitely coming back and baking a cake or two, like this olive oil cake. Hope you have a lovely Sunday. 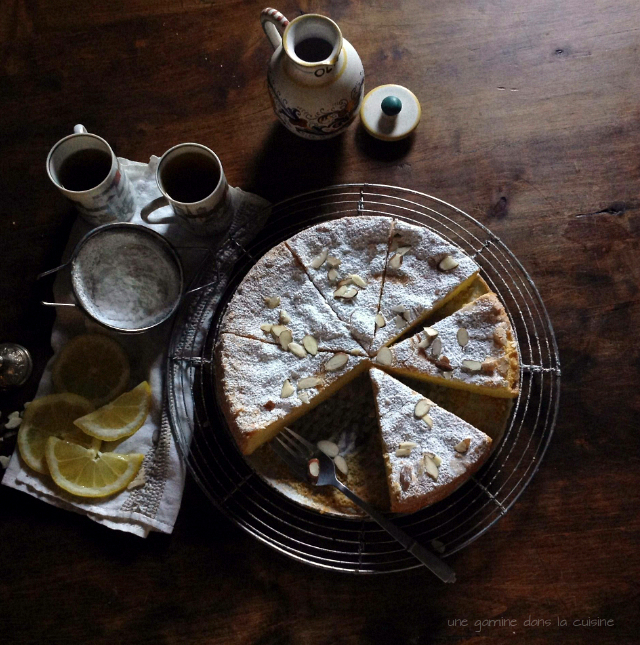 What a beautiful cake and just love the ingredients using EVOO, almonds and lemons. Beautifully captured, Valerie! Look delicious and beautiful Valerie! this is incredibly beautiful. love your photography... thanks for sharing the great recipe Valerie, definitely a recipe i will be saving. Thank you for the lovely compliment, Thalia. :-) Your blog title, "butter and brioche." already finds me dreaming of breakfast! your cakes look wonderful..if i made this lemon cake i'd eat it all in one go! - your photography is beautiful but mostly i am stunned by your eloquence and the way you write...have you written a novel (?) - and if you have do tell us the title!) - and if you haven't, that is a true loss to the world of literature! i studied Eng Lit, but i would give anything to write like you...! ty for the recipes! Thank you muchly for the lovely words!